Today is the birthday of John Stocker (August 5, 1850-July 19, 1903). He was born in Baden, Germany, but moved to Pennsylvania, working for Frederick Lauer in Reading for 17 years before opening his own small brewery with John Roehrich in 1891, initially known as the John C. Stocker & John Roehrich Brewery. 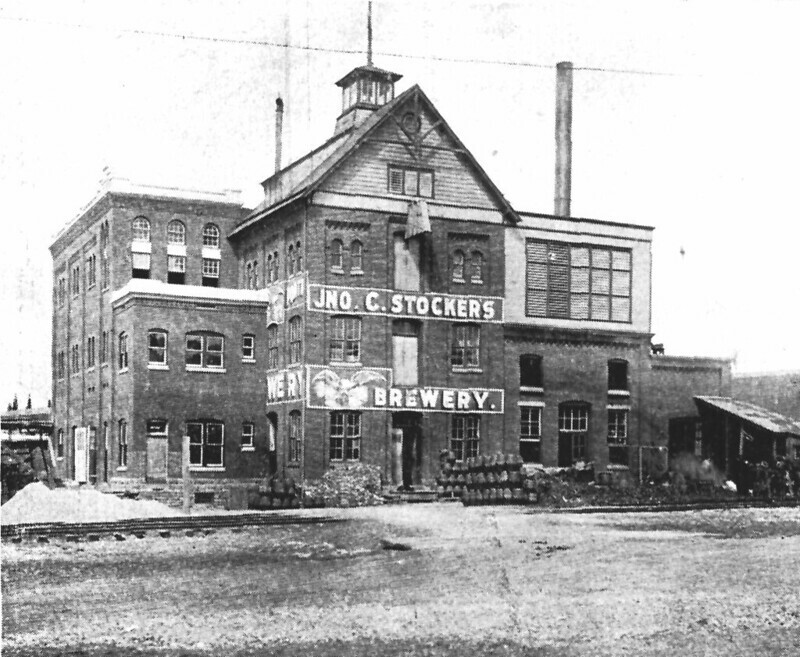 By 1897, Stocker was the sole owner and renamed it the John C. Stocker Brewery. There seems to be some confusion about his middle initial. Some sources say it was a “C” while others report it was a “G.” The brewery continued after he died, briefly as the Estate of John C. Stocker Brewery for two years, and then it became known as the Fairview Brewery, until 1912. From 1912 until closed by prohibition it was called the Mt. Penn Brewing Co. It reopened after prohibition as the Fisher Brewing Co., at least until 1934. Thereafter it was known briefly as the Woerner Brewery and then the Adam C. Jaeger Brewing Co. until it closed for good in 1943. I was unable ti find any photos of Stocker. John Stocker, a worthy and honored citizen and prominent business man of Reading, died at Carlsbad, Bohemia, July 19, 1903. Mr. Stocker was born in Baden, Germany, Aug. 5, 1850, son of John and Catherine (Werren) Stocker, both of whom were natives of the same section of the German Empire. The will of John Stocker was made only a short time before Mr. Stocker sailed for Germany for his health, and left his entire estate to his widow. His son John Stocker was named as the executor. The estate was a large one, with up to $200,000 in real estate, with about $15,000 personal property. The real estate included the Stocker brewery, near the fair ground, his late residence located at 1700 North 11th Street, and a number of hotel stands in the city and county. The brewer’s license of John Stocker for the brewery at 2100 North 11th; was granted by Judge Endlich to John Stocker, his son. John Stocker was reared to manhood in his native land, and was afforded the advantages of the excellent schools there. In 1869, at the age of nineteen years, he emigrated to America and took up his residence in Reading, Pa., where he secured employment in the brewery of Peter Barbey. 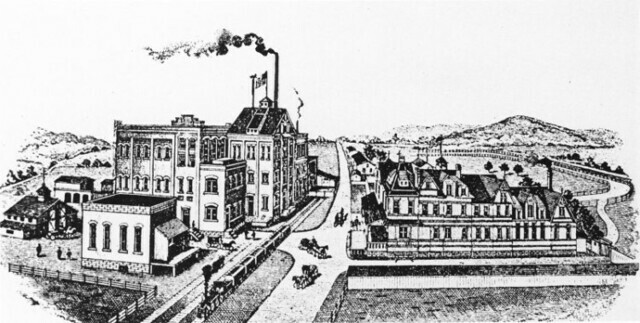 Later he identified himself with the operation of the brewery of Frederick Lauer, and after continuing in the employment of others for seventeen years he removed to Tremont, Schuylkill County, where he and his brother-in-law, John Roerich, rented a brewery, which they operated for the ensuing six years. 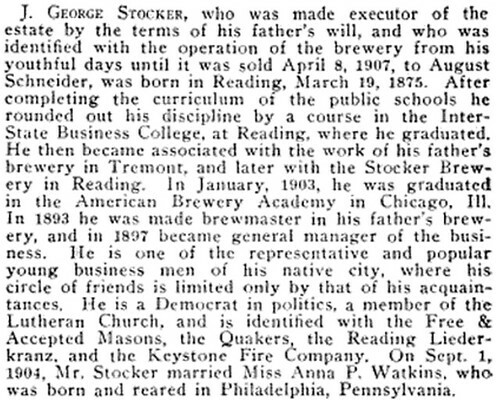 Mr. Stocker then disposed of his interest in the enterprise and returned to Reading, where he built up a large and profitable business in the ownership and operation of what was known as the Stocker Brewery. He was thoroughly familiar with all details of the business, gave to his plant careful personal supervision and gained for the output a high standard of excellence. Mr. Stocker continued the executive head of the brewery until his death. Mr. Stocker was survived by his wife, whose maiden name was Catherine Roerich, and by five (children: Henry, J. George, Catherine (wife of Charles Deale), Adam (who was killed by the explosion of a beer vat, Oct. 20, 1905, at the age of twenty-six years, two months, eighteen days), and Caroline. John Stocker, his son, who was made executor of the estate by the terms of his father’s will, and who was identified with the operation of the brewery from his youthful days was born in Reading, March 19, 1875. After completing the curriculum of the public schools he rounded out his discipline by a course in the Inter-State Business College, at Reading, where he graduated. He then became associated with the work of his father’s brewery in Tremont, and later with the Stocker Brewery in Reading. In January, 1903, he was graduated in the American Brewery Academy in Chicago, Ill. In 1893 he was made brewmaster in his father’s brewery, and in 1897 became general manager of the business. On Sept. 1, 1904, Mr. Stocker married Miss Anna P. Watkins, who was born and reared in Philadelphia, Pennsylvania. On April 8, 1907 John Stocker disposed of the Stocker Brewery. The Stocker brewery, located at 2100 North Eleventh Street, and the Stocker residence, located at 1700 North Eleventh Street, were sold to Augustus Snyder, a brewer, of Pittsburg. The price was never made public. After the sale of the brewery Mr. Stocker attended to the affairs of the estate and for a short time conducted the Stocker Cafe, at 13 North Eighth Street. John Stocker died suddenly in St. Joseph’s Hospital at 6:45 o’clock April 13, 1933. He was admitted to the institution from his home, 805 Centre Avenue, at 12:45 o’clock in the morning. He was in ill health for three months prior, but not seriously. He was 58 years old. John C Stocker is my 2nd great grandfather. I’ll see if I have any more information on him.